Everyone loves music, and it’s been called the one universal language we all share. Many people are amazed, however, at how drastically different their favorite music sounds after moving from cheap speakers to a hi-fi speaker setup. This also holds true when it comes to television, movies, and gaming. The overall entertainment value is upped when every little bump, thump, and rumble is felt. Some people are wholly content with built-in laptop/TV speakers and cheap earbuds. If, on the other hand, you’re seeking a clearer, higher-quality experience this article is for you. It’s intended to serve as a guide for buyers looking for the best bookshelf speakers on the market. If you’re looking for a great set of budget earbuds, look here. Prospective buyers are often taken aback by the vast number of speakers available on the market. Admittedly, the buying experience becomes even more intimidating when they discover the vast number of brands and models – some of which are good, others not so much. Generally speaking, speakers fall into one of the following categories: monitors, P/A, sound bar, portable, satellite, floor-standing, wall/ceiling mount, and bookshelf. Each category is catered to a particular use case. For example, floor-standing speakers tend to be catered toward home theaters, while portable speakers are best suited for on-the-go situations such as picnics. When it comes to overall home entertainment, however, bookshelf speakers reign supreme in terms of quality, ease-of-use, and usefulness. Entry-level buyers are often surprised to find out how many seemingly insignificant variables impact a speaker’s sonic qualities. Your layout, as well as common household items such as rugs, couches, and bookshelves, play a role in a room’s acoustics. As a general rule, large speakers don’t sound all too great in small rooms because the bouncing sound waves can interfere with each other resulting in a “muddy” tonal quality. The inverse holds true for small speakers in a large room. Next, you should consider some of the specs you’re after. A few things to keep in mind include the type of amplifier, driver size, input types, output types, power output, frequency range, impendence, and lastly whether the speaker is active or passive. Lastly, you’ll want to dwell on a few personal preferences. For example, are you after aesthetic value as well, or does sound quality far supersede looks? How do you feel about the tonal coloration added by some amplifiers? Do you prefer a clearer, unadulterated listening experience, or is the warmth and color furnished by some amplifiers preferable? Also, you should consider what your speakers will primarily be used for. That is, will they be added to your entertainment system to enhance your home theater, or more often used to listen to music? Are you going to stream your beautiful singing voice with one of these microphones? Will you primarily listen to a genre that’s heavily reliant on the mid & high frequencies such as classical or jazz – or bass-laden, lower frequency music like techno, dubstep, or hip-hop? Audioengine is an American-based speaker company that designs award-winning speakers for demanding music enthusiast. Anyone seeking a superior listening experience will find the company’s HD3 line of bookshelf speakers to be a suitable match. The sound-quality purist who is reading this will cringe after finding out the HD3 are wireless. History has shown us that hi-fi and wireless usually don’t fit together. Audioengine, however, dared to challenge this notion and embarked on the task of engineering a wireless speaker that could match the sound quality produced by wires. What they’ve come up with is a new line of audiophile-grade wireless speakers designed for desktop and living room environments. Housed within the HD3 is a class A/B dual analog monolithic amp that supplies the boost that the 2.75-inch Kevlar woofers need in order to stand out. Atop the woofer of each speaker is a 3/4-inch silk dome tweeter. As far as output, each speaker has an RMS of 15W and peaks at 30W per channel for a total of 60W peak power. In addition to streaming your music wirelessly, Audioengine has also furnished users with wired, digital, and analog connections. To see other highly acclaimed Bluetooth speakers, click here. ELAC has been around since the 1920’s. Over the years they’ve produced many highly acclaimed speakers and speaker technologies, but nothing has been more universally loved than their “Debut” series of speakers. As amazing as the original Debut series was, ELAC decide to abandon the “if it ain’t broke” philosophy and improve upon an already beloved speaker series. After years of toiling away, ELAC finally unveiled the Debut 2.0 series in March 2018. Of the lot, the ELAC B6.2 already stands out as a leading bookshelf speaker. One of the first things many speaker enthusiasts will notice is the neo-retro design. It’s quite apparent that Andrew Jones, the designer, was heavily influenced by old British manufacturers like Wharfedale. The front of the B6.2 boasts a 1-inch silk dome tweeter, 6.5-inch Aramid-Fiber woofer, and a bass port, which was omitted from the original. Considering the speaker’s 44Hz – 35Hz response range and 87dB sensitivity, it’s best suited for medium-size rooms. Many see the S1000DB from Edifier as the beautiful swan swimming among the ugly (or at least bland) ducklings. Whereas a lot of bookshelf speakers are boring, or otherwise monotonous, the S1000DB is a speaker that you can proudly parade. Granted, how a speaker looks is far less important than how it sounds; nevertheless, when manufacturers take time to skillfully craft a speaker that’s as visually stimulating as the S1000DB, it’s worth mention. Looks aside, the sound quality of the Edifier S1000DB is equally impressive. Embedded into each speaker is proprietary DSP technology that allows the pair to produce clean, articulate sound at 120 RMS. There’s also a state-of-the-art aptX Bluetooth, which greatly enhances audio quality and improves latency issues that often plague wireless technology. There are many reasons why you should add the LS50 from KEF to your shortlist of best bookshelf speakers, but above all is its superbly supreme sound. Never has a speaker at this price point delivered such a profound listening experience. The LS50 is marketed by KEF as a “mini monitor,” but at 11.9 x 7.9 x 10.9-inches (H x W x D), the only thing that’s miniature about this speaker is its well-built housing. KEF’s engineering team decided to use a polyester and glass material known as DMC for the front panel. The rest of the box is made from MDF to remove unwanted resonances. Interestingly, the reflex ports are also worthy of mention considering they’re made from a more flexible material than most. Even more impressive than the construction is the amazingly engineered Uni-Q array drive unit. KEF’s LS50 was conceived based on the “two-way bass reflex” design. Whereas most high-quality speakers use separate tweeter and dome units for highs, mids and lows, state-of-the-art Uni-Q array drive unit technologies allow the one unit to respond to all frequencies in the range of 79Hz – 28kHz. To further enhance the soundscape dynamics of the LS50, a high-frequency waveguide is engineered atop the tweeter section of the Uni-Q. In all, you’re not likely going to find a better pair of bookshelf speakers without spending thousands of dollars more. Klipsch is well-known for its high-end monitor speakers, which is why no one would dare doubt the sound quality on anything they support. The R-41M speakers are ideal for a home setting because they integrate well with any interior design and look impressive regardless of their location. The exposed fasteners and the removable magnetic grill combine perfectly with the wood grain vinyl case that is scratch-resistant and textured. So, if you’re looking for a speaker that will deliver fantastic audios and impress your guests, this is the perfect solution! With one single 4″ spun-copper Injection Molded Graphite woofer, 1” aluminum Linear Travel Suspension tweeter, and a 90×90 square Tractrix Horn, the speaker can reach an impressive 68Hz -21kHz frequency range. They are also loud without being overpowering and minimize any distortions for detailed performances. Thus, you’ll be able to hear new notes in your favorite tunes, and your home theater setting will provide new experiences and emotions. 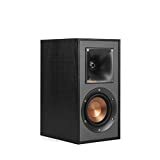 If you’re looking for bookshelf speakers that deliver an unmatched soundstage, realistic highs & lows, and detail only found on setups that cost thousands of dollars, look no further. The 3020 from Q Acoustics is easily some of the best bookshelf speakers on the market. Best known for its excellent dispersion, low distortion, and advanced 3000 Series Concentric Ring Dome tweeters, the 3020 is an audiophile’s ideal speaker. Each unit measures 10.23 x 6.69 x 8.89 (H x W x D) and has a recommended power of 25 – 75 watts. The frequency response is an impressive 64Hz – 22 kHz with a sensitivity of 88dB. The A2+ is a hand-built, audiophile-quality speaker from the Audioengine. These spacious-sounding speakers provide professional grade audio at a very affordable price point. Audioengine designed the A2+ to be the best bookshelf speaker for people streaming music from smart devices and computers. The company’s state-of-the-art DAC technology allows music purist to stream ultra-high quality music files via USB. With a frequency response of 65Hz – 22kHz, the A2+ have no trouble hitting those low tones, however, the company smartly furnished an RCA output to connect a subwoofer. All in all, considering the affordability, excellent sound, and overall build-quality, these speakers must be added to serious shortlist for those who use a laptop, including a low-budget yet excellent one. The Edifier R1700BT is sold as a lower cost alternative to the S1000DB also covered on this list. 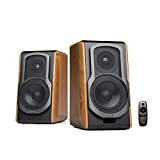 At price of $150 for the pair, the deep price cuts don’t mean a tremendous sacrifice in terms of sound quality. In fact, many who have double-blind tested both the S1000DB and its $150 kin will tell you it’s not easy to tell which is the more advanced system. When the removable grille is absent from the front panel, you’ll see the .75-inch dome tweeter and 4-inch bass. Overall, the R1700BT is ideal for anyone looking to improve the quality of their TV, computer, or gaming experience. Out of the box, these speakers come with everything for you to start enjoying them upon arrival. 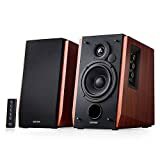 The SVS Prime Bookshelf Speakers were made for audiophiles looking for a true two-channel speaker as well as home cinema fanatics who are desperate for the best surround sound experience. In short, these hi-fi speakers from SVS provide users a fully transparent, highly accurate listening and entertainment experience. SVS’s front panel consists of a 1-inch FEA-optimized aluminum tweeter and a 6.5-inch polypropylene woofer that delivers deep, rich bass. 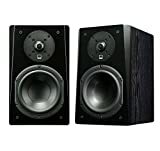 In all, the Prime Bookshelf Speakers have a frequency range of 48Hz – 25kHz, a sensitivity of 87dB, and work best with an amplifier providing 20 – 150 watt of power. 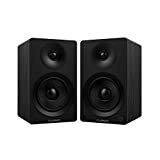 No matter if you’re planning to use the SVS Prime Bookshelf Speakers as two-channel reference monitors, or surround sound speakers for a multi-channel home theater you’re sure to enjoy its expansive sonic qualities. The NHT C-3 is a new and improved version of the company’s best selling “Classic Three” speaker design. Perhaps the most impressive thing about the new 13.75 x 7.5 x 10.125-inch (H x W x D) NHT C-3 design is the deeper, more impactful bass. Unlike similarly priced units, the C-3’s cavernous bass dips way down to 40Hz, meaning a subwoofer isn’t necessary for most setups. This power is derived from NHT’s distinctive aluminum cone and dome design in conjunction with its proprietary 3-way acoustic suspension. 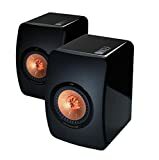 In addition to deep cutting low-end, these speakers have an overall excellent soundstage thanks to its frequency response of 55Hz – 20kHz and a sensitivity of 87dB. 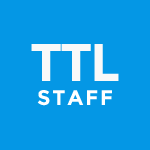 NHT recommends 50 – 150 watts per channel. The sonic bliss achieved by the joining of ELAC’s skillfully made soft-dome tweeter and their 5.25-inch aluminum cone is nearly indescribable. “Heavenly” is perhaps the best single-word description of the mids and highs – “monstrous” is best suited when attempting to describe the deep, roaring bass sonics. The rich and highly articulate bass produced by the ELAC Uni-fi UB5 can be attributed to the speaker’s large vented pole magnet. This unique design allows this speaker to cleanly and more accurately reproduce low frequencies. All in all, there’s perhaps no better bookshelf speaker than the Uni-fi UB5 for home theater and music enthusiast who are after a clean, accurate, sophisticated experience. These speakers pack two of the most important features: good looks and audio performance! Designed with a gorgeous-looking wood cabinet (in different colors), the speakers will catch your eye the moment you enter the room. But the design is not just for looks; the wood cabined is acoustically tuned to deliver distortion-free and warm sound that cradles the soul and tickles the mind. Sound-quality is just right, with a powerful punch and room-filling stereo audios that will bring the house down when you’re watching movies, playing games, or throwing a party. This is possible due to the integrated class D amplifier which is softened by the silk soft-dome tweeters that keep the highs natural. Also, the glass fiber drivers bring up detailed mids and deep bass. Moreover, they can be connected to any sources from turntables to microphones, PCs to gaming consoles. Not to mention, they are easy to install due to the plug and play connection method that allows for both RCA and Bluetooth aptX. You should give the Definitive Technology D11 bookshelf speakers a try. They are very unique looking and beautiful sounding.